Hate’s Busy Week | Stop Islamophobia Now! The burnt-out remains of the Joplin, MO Mosque. Indeed, We sent the Qur’an down during the Night of Decree. Narrated through the traditions of the Prophet Muhammad (peace be upon him), we are told that this blessed night occurs within the last 10 nights, likely to be one of the odd nights, i.e. 21st, 23rd, 25th, 27th. As the surah above tells us, worshipping on this night carries more credit than worshipping continuously for 1000 months – almost 84 years. To put it simply – the last 10 days of Ramadan are like the Olympics of worship in Islam. A Rhode Island mosque is vandalized when an assailant damages the center’s sign. Ontario, California – pigs legs were thrown out on the driveway of a future Islamic Center – where worshippers gathered to observe prayers at the mosque site. Witnesses say two women in a pickup truck were the perpetrators of the crime. Shots were fired outside a Morton Grove, IL mosque – luckily nobody was injured. Authorities have arrested a 51 year old white male named David Conrad – who allegedly fired his high-powered air-rifle at the house of worship. An Oklahoma City mosque was shot by an assailant with a paintball gun in the late night hours. *All these attacks come in the aftermath of the devastating attacks in Wisconsin, where half a dozen Sikh worshippers were killed in cold blood by white-supremacist, Wade Michael Page. Within the last 2 years, we have seen the level of Islamophobia spike to unprecedented grounds. Starting with the Park 51 controversy in 2010, the level of vitriol and anti-Muslim rhetoric has risen to levels unseen even in the aftermath of 9/11. Additionally, the amount of money put into feeding the Islamophobia industry has grown into the tens of millions of dollars. As we have seen from comments made by elected officials such as Reps Michele Bachmann and Joe Walsh, Islamophobia is not a tactic for those on the fringe anymore – it is now mainstream. Candidates and politicians utilize this tactic in order to stir up their base, in order to get a short-term bump in the polls – and to increase fundraising. And this tactic seems to work – as seen by Michele Bachmann’s $1 Million fundraising spike, in the aftermath of her Muslim Brotherhood government infiltration comments last month. As we can see by the actions of the last week alone – these irresponsible comments have a larger, more negative impact on society. It is a sad truth that Islamic centers in the U.S have become accustomed to vandalism in some way, shape or form within the last few years. Any disrespect to a house of worship should be considered a threat to religious freedom in this nation – but there is a demarcation point between acts like teens throwing lemons – as in the Hayward case, and the gun violence that has now rocked the faith community for the last week. The Oak Creek case, along with Joplin and Morton Grove are key examples of how the rhetoric is allowing some deranged segments of society to justify lethal tactics as a manifestation of their hate. It remains to be seen whether the same right-wing leadership that stokes fear of Islam in America will come out in defense of our community in the wake of this ever-growing cluster of attacks – but we’re not holding our breath. There is no doubt that there is some sort of correlation between the elected officials’ comments and the upswing in violence – but rather than taking a step back from this dangerous rhetoric, the lunatic fringe is doubling down. One can’t help think morbid thoughts when faced with a cluster of such hateful actions within such a short timeframe. Thankfully within this seemingly endless string of bad news – arose some good news – in the hardest hit of all the mosques – Joplin, Missouri. If there was any community that desperately needed some good news – this would be the one. The town entered the nation’s conscience last year when it was hit by a deadly tornado, killing nearly 200 residents. As they continue to rebuild the city, the community has now been struck with a new plague: Hate. The Muslim community was targeted just over a month ago, when an individual was caught on surveillance throwing an incendiary device on the roof of the mosque, causing damage to the building. The perpetrator was never caught, and the community seemingly would put this scary event behind them. 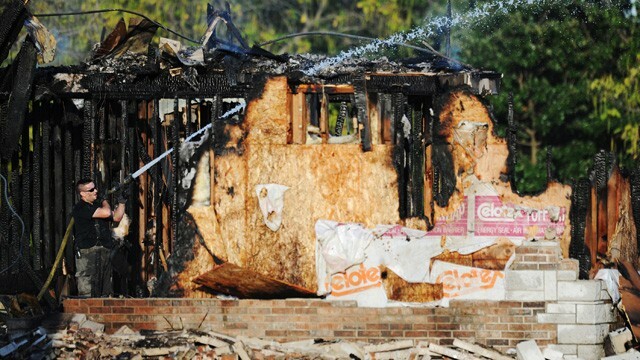 Last Monday, the mosque was once again targeted – this time burnt to its foundations. Even though this looks to be a time of despair and grief for Joplin’s Muslims – we have seen the true spirit of community arise from all over America to help rebuild this house of worship. Within a few days of the attack, a donation site was put up in order to help raise funds to rebuild Joplin’s mosque. The fundraising goal for the project serving this small community was ambitious – raise $250,000 within 45 days. In the old days, it took more along the lines of 45 months for small communities to raise such a large amount of money. However this cause has struck a chord within the American landscape – and the fundraising goal was met in a mere 60 hours – 2.5 days. You can view the donation site here – as you can see the great outpouring of love and generosity has helped push their project forward and up to now has nearly raised $350k. Joplin churches have come together to host the Muslim community for an iftar (breaking the fast at sundown) – in a sign of solidarity. As the American Sikh community still recovers from the Wisconsin shooting, there has also been an outpouring of compassion from Americans of all faiths in order to show unity. Candlelight vigils and interfaith memorial services have been held in many major cities throughout the nation. As we can see, the spirit of love and shared humanity can overcome the most unthinkable acts. But the question is, how do we stop this endless cycle of hate and disrespect for our houses of worship? The true American spirit is one of tolerance, religious freedom and embracing of differences. However, throughout this nation’s history there have always been those forces that have rebelled against this concept – whether that is with rhetoric or violence. Those previous dark chapters were thought to have been put to bed – but as we can see, hatred does not sleep easily. In these most blessed nights of the year, it is worth our prayers to put an end to all these senseless attacks for good. Imraan Siddiqi is a CAIR-Arizona Board Member, Editor of StopIslamophobiaNow.com, & an Entrepreneur. He writes on the experiences of Muslim Americans as well as the subject of Islamophobia. He has been published in outlets such as The Dallas Morning News, The Oregonian, Huffington Post, CounterPunch, SuhaibWebb.com, altMuslim, among many other media outlets. You can follow him on Twitter @imraansiddiqi.